From a historical perspective, the location of our home and the local surrounding area is indelibly linked with the launch (kick off) of ‘Operation Cobra’ 24th/25th July 1944. 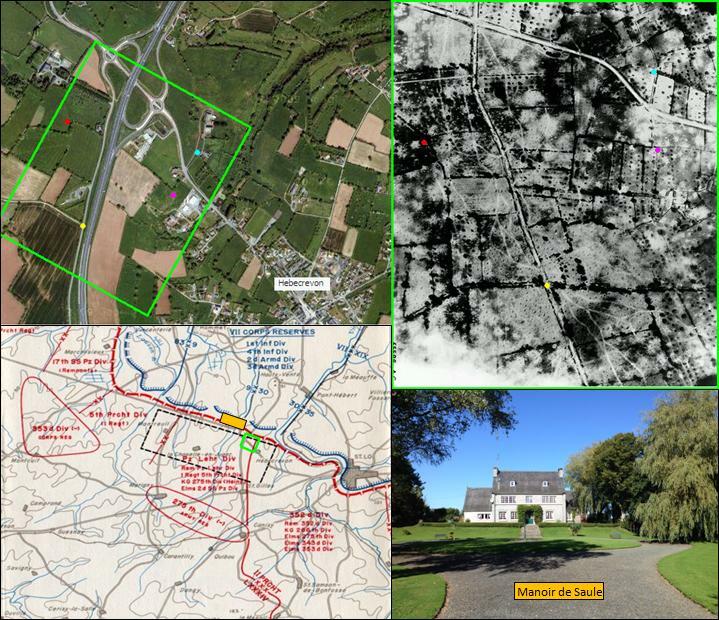 The location of Manoir de Saule is relatively central along the northern side of what become known as the ‘Bombing Box’ where the US troops faced their foe prior to one of the most condensed bombing raids carried out during the European Theatre of Operations (ETO). ‘Operation Cobra’ was one of the most significant turning points in WW2 history as it was to be the main starting point of the ‘Normandy Breakout’ which after some of the fiercest hedgerow fighting on the ground, lead to the liberation of Paris, France and then ultimately, some 10 months later, the end of the War in Europe. 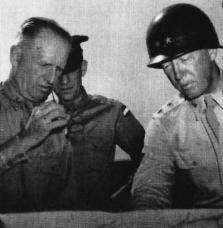 The breakthrough was designed to create a wide gap in the German defensive line, their Main Line of Resistance so that Gen. George Patton and his newly created Third US Army, composed of the 1st Infantry Division and the 2nd and 3rd Armoured Divisions, could pass through and make a speedy dash for Avranches and the Brittany peninsula. 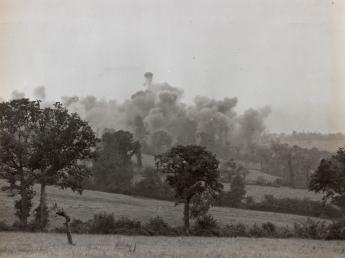 The breakthrough was to be preceded by a heavy saturation bombing by the US Air Corps, composed of fighter bombers, medium and heavy bombers. Following this saturation bombing, the three battle tested US Army Infantry Divisions, the 4th, 9th and the 30th positioned north of the main road were waiting for the ‘jump off’ order to attack. In total 350 Fighter-bombers, 400 Medium bombers and 1,500 Heavy bombers took part in the saturation bombing of the area. As shown by the dotted rectangular box in the map insert, the target area was 2,500 yards deep and 6,000 yards wide, running parallel and to the south of the St. Lo to Périers highway. On July 23rd, General Omar Bradley, having flown back to England to confer with the US Air Corps, insisted that the mission be flown so that the bombing would be parallel to and just south of the St. Lo to Périers road. 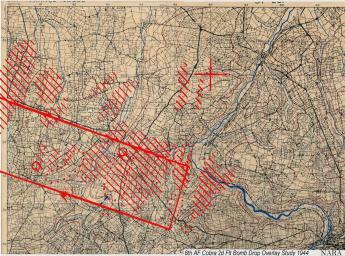 The Air Corps insisted that the mission be flown perpendicular to the main road, coming in over the top of the troops. After much discussion, it was agreed that the bombing mission would be flown parallel to the highway, although at a higher risk of loss of aircraft. Originally, Operation Cobra had been planned for the 18th July, but owing to poor weather conditions, it was postponed until the 21st. Again because of bad weather, it was further postponed to the 24th. The ‘jump-off’ for the ground troops attack was scheduled for 11:30 A.M. and the aerial bombardment was planned to be executed 15 minutes earlier. For safety reasons, the troops were ordered to be withdrawn approximately 1,200 yards, approximately ½ mile thus to avoid the risk of being caught by any stray bombs falling off their assigned target. At this same time, the 230th Field Artillery Battalion fired several rounds of red smoke shells from each Battery precisely on their target, an area on the south side of the St. Lo to Périers road. This was to more clearly identify the location of the road for the benefit of the Air Corps in aiming their bombs to the prescribed target. Unknown to all at the time but a slight breeze of 2-3 miles per hour was blowing directly from the south. This wafted the red smoke directly over the US troops at the scheduled time of the bomb drop. At the prescribed time, the drone of the oncoming planes was heard, well before the time that they could be seen. Then the 2,250 planes came into view, and in the words of many, “the sky was black and totally obscured the sun”. However, the aircraft arrived from behind the front line fling in a North to South direction – this contrary to what had been previously agreed that being the flight path from the West to East, flying across the front line, parallel to the road. Even in spite of this, many cheers went up, knowing full well that these planes were going to be dropping their bomb loads momentarily, right on target – right on top of the Germans, in a rectangular ‘bombing box’ having an area of 2,500 yards deep and 6,000 yards wide (approximately 1 ½ miles by 3 ½ miles) just south of the St. Lo to Périers road. While looking upwards at the approaching bombers the American troops could clearly see the bomb bays of the aircraft open, in preparation of bomb load release. Whilst the majority of bombs hit their target within the ‘bombing box’, US ground troops were horrified to see a percentage of bombs plummeting down prematurely and heading directly for those who had withdrawn the 1,200 yards to the rear. Whoomp! Whoomp!! Whoomp!!! These bombs landed over the staging area precisely on the red smoke line, which had drifted back over them. As the troops that had been moved back knew at the time that this was a temporary safety measure, they had therefore not dug any fox holes for protection. It was some 20 minutes into the bombing before the operation was cancelled due to poor visibility, by which time the damage had been done! The result of this bombing error came at a cost 24 men killed and 128 wounded. Needless to say this attack was immediately called off, but it was rescheduled again for the same time the next day. It was too soon and without enough notice the replacements for the men lost were unable to be sent forward in time. The following day, the same preparations were made in anticipation of a more smoothly coordinated attack, with all assurances that the bombing this time would have the West to East flightpath as had been promised the previous day. Now it was to be a “have to go” situation, as the element of surprise had been lost. The following morning, the attack was set 11:00 A.M. with a saturation bombing to take place 15 minutes prior to the hour just as before. Likewise, the 230th F.A. Battalion was to place their red smoke shells just south of the St. Lo to Périers road. Soon the roar of the planes was heard, and then they came into view. As on the previous day, “the sky was black with planes”! and Yes, they were coming in again from the rear, perpendicular to the St. Lo to Périers road, contrary to what had been agreed. However, this time the troops being a little bit more cautious and jittery, had dug substantially deep fox holes or slit trenches for their own protection – “just in case”! At the precise time that the 230th F.A. Bn. placed their red smoke shells on the MLR just south of the St. Lo to Périers road. Incredibly, that same southerly breeze came up from the south, causing the red smoke to drift northwards to a point right over the troops - a complete repetition of the day before! Once again the ground troops were horrified to see the bomb bays open up prematurely, and see the bombs dropping down directly towards them. The ordnance dropped typically comprised 1,000 lbs. and 500 lbs bombs with the larger bombs creating craters some 20 feet deep and 30-40 feet across, depending on the consistency of the soil where they hit. Needless to say, this caused many tons of earth to be propelled upwards, outwards and then down. Without any further explanation, these piles of earth came cascading down on top of the troops whom dug into their fox holes in many instances, were buried alive with little or no chance of recovery or survival. At the close of the bombing, the first reactions were to attempt to dig out any known comrades whom were known to have been buried. In most cases, it was hopeless and too late! The 30th Infantry Division suffered the worst casualties, another 64 killed, 324 wounded and 60 Missing – mostly buried alive, and 164 cases of Battle Fatigue. Those who were missing were later unearthed by Engineers with bulldozers and the bodies recovered by the Graves Registration Unit. 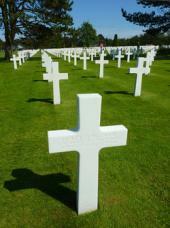 Many of them are still buried in the Normandy American Military Cemetery overlooking Omaha Beach, where they first landed only a month earlier. Ironically, Lt. Gen. Leslie McNair, Chief of the Ground Forces in Europe, had come forward to the 2nd Battalion Headquarters of the 120th Regiment to observe and try to determine what had gone wrong the preceding day in order to make the necessary adjustments in planning, so that this could be prevented from happening again. Lt. Gen. Leslie McNair was killed during the second bombing raid on the 25th July, and he was the highest ranking officer to be killed in action during the entire European Campaign. His death was not announced officially for many months after the incident, so as not to give the enemy the satisfaction of knowing that one of the US Army highest ranking officers had been killed by friendly fire. It can be asked, “Why didn’t the ground troops contact the Air Corps and direct them away from the area, and let them know that things had changed on the ground”? In any such operation at that time, the Air Corps was still stationed in England. Once they had left their air bases, they had to maintain ‘radio silence’, and they could not be contacted from the ground. Radio messages had to be transmitted from the ground unit concerned, back through Corps Headquarters, then to Army Headquarters, and they in turn would contact the Air Corps in England. Only “They” could contact the planes to change course or a mission. Too much time would have elapsed anyway, and the mission accomplished before they could possibly be contacted. All messages sent, had to be coded, then decoded at each transfer point for approval, and this took up too much valuable time. This system was changed some time later based on this incident, whereby the Air Corps had a Ground-to-Air Liaison Officer, who was situated at the Division level and with the coordination with the Division Commander, he was authorized to abort or change a mission. 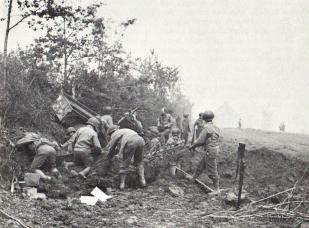 The Division, Corps and Army artillery units, in a coordinated effort, saturated the area that the ground troops were to attack and in spite of the troops weakness at the time, the German defenders were more groggy than had been anticipated so the attack on their MLR was very costly. For the US troops it proved successful allowing for good headway during the day and the next several days. This allowed Gen. Patton and his Third US Army to go through the gap made in the front lines with his armoured and infantry divisions to make a headlong dash for Brittany. 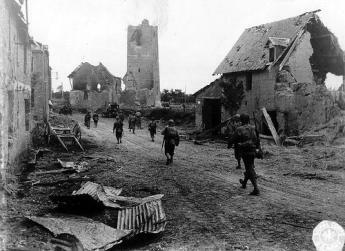 Operation Cobra was a complete success, and it allowed the U.S. First Army to move forward along the entire line across the Cotentin peninsula. This brought to a close the Normandy Campaign, and as the German High Command put it, “This was the first major turning point of the war” that led to the ultimate allied victory 10 months later. The incredible devastation of St. 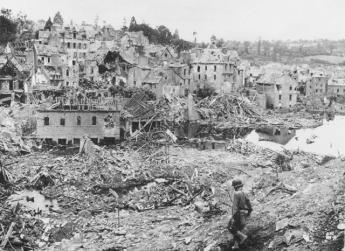 Lo after aerial bombing just prior to ‘Operation Cobra’. Yet more destruction after the ‘Cobra’ bombings in our neighbouring village of Hebrecrevon. 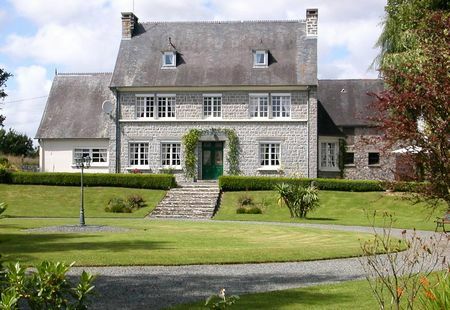 30 La Montanguerie - 50620 Amigny – Manche – Lower Normandy - France. ©2016 Manoir de Saule. Please do not reproduce without permission.